Art therapist Harriet Wadeson made two critical decisions when she was diagnosed at age 78 with uterine cancer (serous papillary carcinoma). First of all, she connected with a team of doctors and committed to treatment - a path that would include surgery, chemotherapy and radiation. Next, as a professional whose life work has focused on the healing power of creative expression, Wadeson began a journal and filled it with words and art pieces that would ultimately become Journaling Cancer in Words and Images. Both choices were lifesaving, ultimately bringing the author to a point of physical and emotional recovery from an aggressive stage III cancer. The journal documents Wadeson's experiences in the healthcare delivery system and at times it's painful to read. She shares in minute detail her daily challenges with treatment's side effects, ranging from constipation to neuropathy. The entries also catalog fights with her partner and disagreements with hospital staff. Then there are those days when her mood swings take her to a dark, hopeless place and she can't possibly imagine a positive outcome. To her credit, Wadeson doesn't present a false front of bravery in the face of pain and suffering. Or pretend to be upbeat when in fact she doesn't feel that way at all. Instead, she honestly and authentically shares with the reader what being a cancer patient really feels like on a day to day basis. Her writing style is straightforward and direct. ...wonder if I will ever feel good again...Cancer Land is the place from which you never return. It is a place of extreme vulnerability, dread, and the fear that your cancer can always return. It is a place of pain and medical torture, a place of fatigue, weakness, and feeling sick. I have been banished from the relatively carefree place where I used to live. Those who live there still wander in and out of my life. They can see the pain and weariness in my face, but they do not live where I do. There is a glass divide between us. We travel different roads. Then there are the author's pictures...haunting images that linger in the mind's eye long after initial viewing. 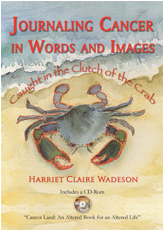 The book features a CD-ROM filled with seventy images of Wadeson's artwork created during her cancer treatment: collages, sketches and watercolors that tell her story and bring the words in her journal vividly to life. (Please note: all of the images are displayed in black and white throughout the text; the color version is only available on the accompanying CD-ROM). For example, there's a compelling sketch of a patient lying on her back in a hospital bed - her body covered with countless wires and tubes that connect to various monitors and machines in the room. The word TETHERED is printed across the top of the picture. After surgery, a patient can feel so powerless - weak and shackled, like a prisoner with no hope of escape. Wadeson's art captures that feeling. Another piece, Restless Everything, shows the author receiving a chemotherapy infusion. Wadeson's self-portrait (complete with baseball cap to cover her newly bald head), features her figure cloned three times with motion lines surrounding her body. Is it the steroids that are making her so restless‚ Or could it be the seemingly endless amount of time it takes for the infusion to end‚ Regardless, the chemo nurses block her path and urge her to settle down. Chemo Brain is a collage mounted on an optical illusion background with two large eyes whose centers are concentric circles. Bravo! Using high contrast scrapbook paper and magic markers, Wadeson has translated the abstract notion of chemobrain into a graphic that suggests exactly what it feels like. Wadeson's process was to take her images and words and place them in what she calls an "altered book." Thankfully, the appendix explains what an altered book is. Artists begin with an inexpensive published book and use the cover and existing pages as a canvas for their new creation, overlaying the original illustrations and text with their own images and words. Fascinating! Wadeson titles her altered book CancerLand and after placing words and images from her journal into her altered book, even chooses to carve a hole into the center section to depict "the black hole into which (her) life has fallen." Building this book, creating something tangible from wisps of experiences, has been immeasurably powerful in pulling me through the torments and terrors of cancer. When cancer's crab grabs you in the clutch of its claws, all other life can be squeezed out of you...you can become your cancer...For me, writing and painting and eventually putting together this book expressed that healthy part of myself that can be productive, even when besieged with disease and fear...For me, they have helped me heal. They have helped me survive. Wadeson's powerful work, with its focus on the importance of art and writing therapies in the healing process, is an important addition to the literature describing the cancer patient experience. Before the publication of Journaling Cancer in Words and Images, the only books that have attempted to link patient art and original text, to the best of my knowledge, are Art.Rage.Us. (Chronicle Books, 1998), Hollis Sigler's Breast Cancer Journal (Hudson Hills Press, 1999) and Fran Padgett's Breast Cancer Recovery: No One Wrote a Manual (Bayou, 2005). Highly recommended reading for oncology professionals as well as those interested in alternative complementary therapies. Evaluating Pain in a Non-Verbal Patient Herbicides and Lymphoma in Dogs Is there a test for lymphedema? Trouble Concentrating & Studying After Cancer Body Image Concerns for Men Normal CA-125 with Recurrence Sugar and cancer Mantle Cell Lymphoma Exposure of Other Pets to Chemotherapy PSA After Radiation?